I visited Peter Fischer at his remote estate near the village of Jouques, on the northern slope of the Montagne Mont-Victoire, the famousand beautiful mountain (much painted by Cézanne) that towers over the city of Aix-en-Provence. Peter was born in Germany, but his interest in winemaking was fostered whilst living in California, where 20 years ago he enrolled at the famous UC Davis to study oenology. He then moved to the south of France and began his search for a suitable property, at a time when the area was in serious decline and the unfashionable vineyards could be bought relatively cheaply. After extensive searches and viewing dozens of estates he settled on his own little patch of Provençal heaven, at the Château Revelette. During his 15 years of ownership Peter has doubled the area under vine to 24 hectares, planted with a whole range of vines: Syrah (5.5HA), Grenache (5HA), Cabernet Sauvignon (4HA), Carignan (2HA) and Cinsault (1HA). For whites there is Chardonnay (2.25HA), Ugni Blanc (2.25HA), Sauvignon Blanc (2.25HA) and Rolle (1HA). Vines are between 10 and 25 years old, and about 50% of his wine is red, 30% rosé and 20% white. 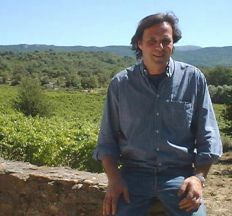 Peter has also established Revelette as a domaine of real quality. His wines are much in demand locally and have won space on the wine lists of gastronomic temples such as restaurants Troisgros and Paul Bocuse as well as plaudits in the Revue de Vins de France, Guide Hachette and others. Basic wines are bottled as Coteaux d’Aix-en-Provence AOC, his top oak-aged red and white – made from Cabernet Sauvignon and Chardonnay respectively – are bottled as Vin de Pays des Bouches du Rhône. Peter farms organically, and whilst he stops short of declaring his wines as bio-dynamic (he is healthily suspicious of this as a bandwagon upon which many are jumping) his methods follow bio-dynamic principles: pruning and spraying (with an organic mixture based on nettles and eggshells) are done according to phases of the moon. The cellar in Château Revelette is a refreshingly workaday and apparantly disorganised space when compared to the glittering temples of Bordeaux or the Napa Valley. But as Peter showed me around and explained the fundamental changes he had made to the old cellar since taking over, it was clear that this was a very well-planned space designed to treat the wines as naturally and sympathetically as possible. Tanks are concrete, all grapes are de-stemmed (apart from a small percentage which undergo carbonic maceration) and natural wild yeasts are used whenever possible. The top red sees around 20% new oak, the remainder in one, two or three year old barrels. The Chardonnay sees 40% new oak and is aged on its lees. Fining is with egg whites, the wines are not filtered. Peter has a wonderfully relaxed and straightforward approach to winemaking (to life it would seem) and he is aghast at the tendency to over-oak and mask the flavours of the grapes and good terroir. Given his Californian education, his wines retain a classical Old World elegance and refinement. The château is open for sales and tastings Monday to Saturday from 14:00 – 18:00 and also on Saturday mornings from 09:00 – 12:00. If you want to meet Peter I’d suggest phoning ahead for an appointment. (45% Cabernet/55% Syrah) Lovely ripeness of fruit here on the nose, very spicy and lush. On the palate medium-bodied with fine ripeness again and nice tannins that grip without dominating. Quite low acidity, but good structure and balance of components. Should be rather good. 50% Syrah, 25% each Grenache and Cabernet Sauvignon. This has good, deep ruby colour and a soft, berry-scented nose, just a touch of jamminess. Really fine fruit on the palate too with great purity, red cherry and blackberry flavours and a nicely sauvage character that is almost minty. Good. 100% Chardonnay. This wine was bottled only two weeks previously. A light golden colour. Smack of new-sawn oak on the nose precedes a fine white fruit character of melon, pear and citrus. Well balanced on the palate, the oak less dominant and a medium-bodied, juicy savouriness evident. Quite concentrated and powerful, this needs a year or two. Good. Mostly Ugni Blanc, Sauvignon Blanc and Rolle. Clean, crisp and lemony cool fruit on the nose and palate. Hints of exotic lime and tropical fruit, crisp acidity. A very good fish and seafood wine, fresh and well made. Solid, dense ruby/purple. Very tight, creamy blackcurrant nose with hints of black pepper and spices. Creamy, smooth and velvety on the palate with very smooth, ripe tannins and lots of minty, blue/black depth to the fruit. Concentrated and rich, yet enough tannins and acidity to freshen, this also has good length. Very good indeed.